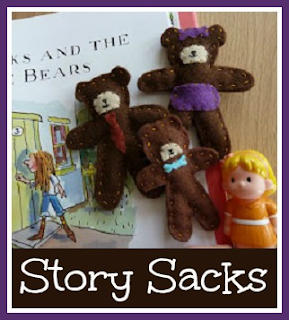 We recently joined the toy library at our local Family and Children Centre, and through this we have been introduced to the fantastic concept of a Story Sack. Along with a great selection of toys, for a joining fee of just £2, every couple of weeks we can choose another sack to take home. I can't believe how much Harry has been loving these sacks. They contain a copy of the book, a non-fiction book related to the story, sometimes an audio CD, a relevant game (they've all been good quality Orchard Toys ones so far) and, most importantly of all, some toys, props or puppets to bring the story to life. Some of them are the official sacks as linked above, and others have been put together by the centre. Harry loves getting more involved in the reading of a story. His favourite activity is to take the puppets and props, and then act out the story as I read it. Because I love watching him interact with the story I made these simple little felt bears for him to play with while I read him the story of Goldilocks and the Three Bears, along with a yellow haired doll. I also got him three bowls and spoons in different sizes and filled them with porridge oats, and he was occupied for ages getting the bears to take it in turns to eat their porridge. 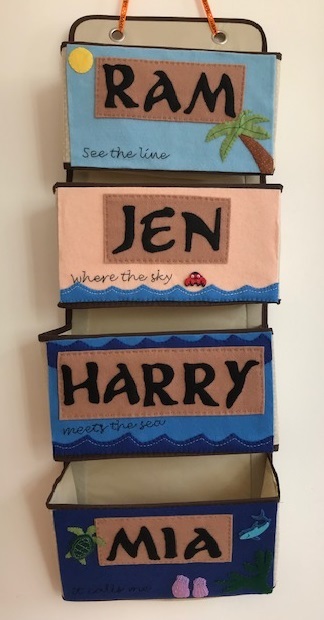 Story Sacks are very expensive to purchase, as I think that really they are aimed at teachers or childminders and so on. But it's really easy to put one together yourself, probably from things that you have around the house anyway. You can also theme some activities around the story, for example you could make and eat porridge, or cut out chairs and beds in different sizes from a catalogue. In addition there are many opportunities to talk about what is happening in the story - how the characters might feel, how you would act in that situation and so on. I'm really interested in ways to bring stories to life, and so hopefully I'll have some more ideas to share soon! I would love to hear about any ways that you make books come alive with your children. You would be such an asset to the local library toddler reading hour! Wonderful ideas. Well, who knows what lies in my future! I really love sharing stories with my little boy, but I never thought of using props to go with them. I would really recommend it, it's fantastic to see them really interacting with a story. They don't even need to be fancy props, we did the chairs for the three bears using the same chair in the living room each time!